Aldi Novel Adilang, 19, had one of the loneliest jobs in the world: He was a lamp keeper for a floating fish trap, 125 kilometers out at sea, with weekly brief human contact and a walkie-talkie. After keeping the trap for months, a hard wind on July 14 blew him thousands of kilometers away from home in North Sulawesi to Guam waters. He now had to cope not only with loneliness, but also hunger, thirst and fear. 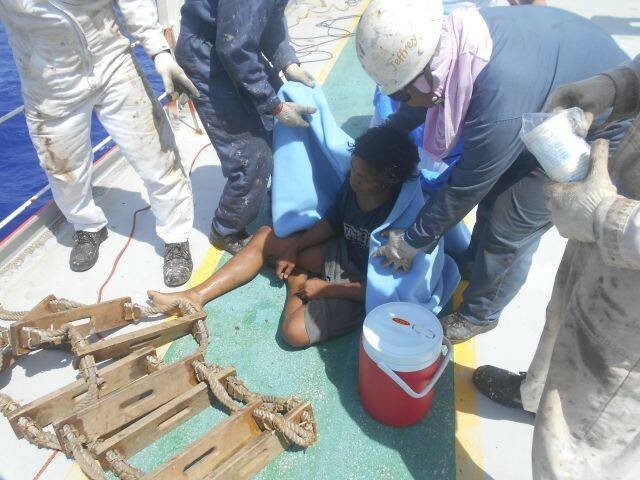 The young man, however, survived for 49 days, until a Panama-flagged vessel, Arpeggio, rescued him in Guam waters. Before that, more than 10 ships had sailed past Aldi, failing to spot him as he waved for help. The fish trap Aldi was working on is called rompong in North Sulawesi. Rompong is a fish aggregator device shaped like a modest hut. It floats in the middle of the sea supported by buoys and anchored to the seabed by a long rope. Aldi was contracted by the fish trap owner to light lamps around the rompong with a power generator every night to attract fish for six months. Every week, the owner would send someone to harvest the fish in the trap and give Aldi a week’s worth of supplies: food, gas for cooking, clean water and fuel for the generator. 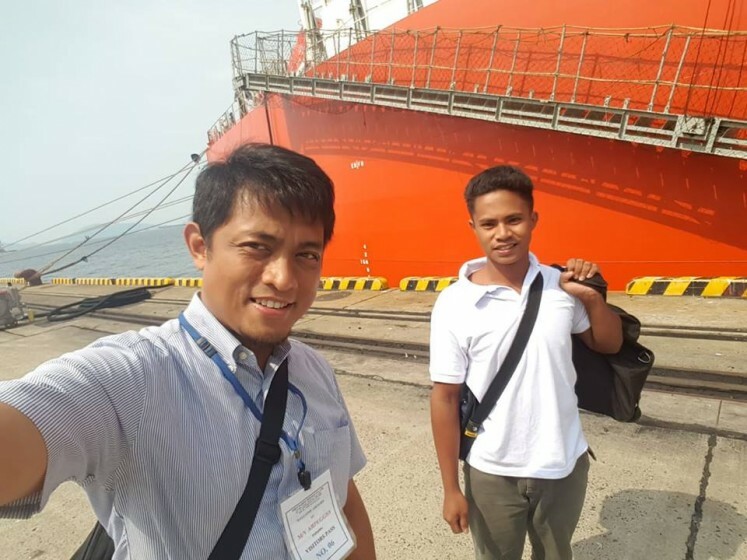 The Indonesian consul general in Osaka, Mirza Nurhidayat, who oversaw the return of Aldi after his rescue, said that, since the device was not a boat, it did not have any paddle or engine. The rope that had kept Aldi’s floating hut in place had torn, and the strong wind had then blown him far to the north. “The rompong owner has many rompong, maybe 50, spread out in waters north of Manado,” Mirza told The Jakarta Post on Sunday. As Aldi was drifting away, his supply was only enough for several days, so he caught fish to stave off hunger and drank sea water. “After he ran out of the cooking gas, he burned the rompong’s wooden fences to make a fire for cooking. He drank by sipping water from his clothes that had been wetted by sea water,” Mirza said. “Aldi said he had been scared and often cried while adrift,” said another diplomat of the consulate in Osaka, Fajar Firdaus. “Every time he saw a large ship, he said, he was hopeful, but more than 10 ships had sailed past him, none of them stopped or saw Aldi,” Fajar went on. On Aug. 31, the bulk carrier Arpeggio sailed past Aldi, who waved his cloth again for help. At first, the ship’s crew did not see him, so Aldi tuned his radio to a frequency a friend of his had once told him to use in case he is blown away and sees a large ship. Fortunately, the ship’s captain caught the signal. Realizing [there was someone pleading for help], he turned around,” said Mirza. But the waves were high that day, so the Arpeggio had difficulty getting close to Aldi. After circling Aldi four times, the ship eventually threw a rope to help him, but the rope did not reach Aldi’s rompong. “Aldi then decided to jump into the sea to grab the rope, while the waves and wind rocked him,” Fajar said. After weeks at sea, Aldi was already very weak and almost lost the rope. “But the ship’s crew managed to catch his hand,” Fajar said. The captain immediately contacted Guam’s coast guard. Because the ship was heading to Japan, Guam’s coast guard told the captain to bring Aldi to Tokuyama, Japan. Arpeggio’s crew immediately gave Aldi a towel and an emergency snack. Afterward, they gave him fresh clothes and food, and the ship’s cook even cut Aldi’s hair. On the same day, Japanese authorities contacted the Indonesian consulate general, said Mirza. His office immediately tried to find Aldi’s family and prepare the necessary documents for his return to Indonesia. “We coordinated with the shipping authorities in Japan, the ship’s captain, the Japanese coast guard and the immigration authorities,” Mirza said. The Arpeggio docked in Japan on Sept. 6 at 3 p.m. But Aldi had to be quarantined for health reasons, so he could not land yet. “We sent our staffer, Teguh, to accompany him and oversee all the process because of the language barrier. 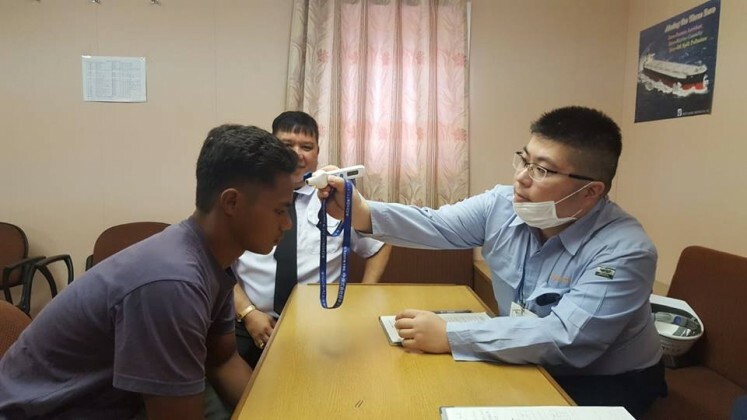 Japan’s coastguard had asked for all sorts of details, including the dates, the shape of the rompong, what he had been doing there and so on, Mirza went on. On Sept. 7, Aldi got the permission to enter Japan, and on Sept. 8 he flew from Japan to Jakarta. Mirza said that, because of the Jebi typhoon in Osaka, his office had to bring Aldi to an airport in Tokyo. The next day, he arrived in Manado. 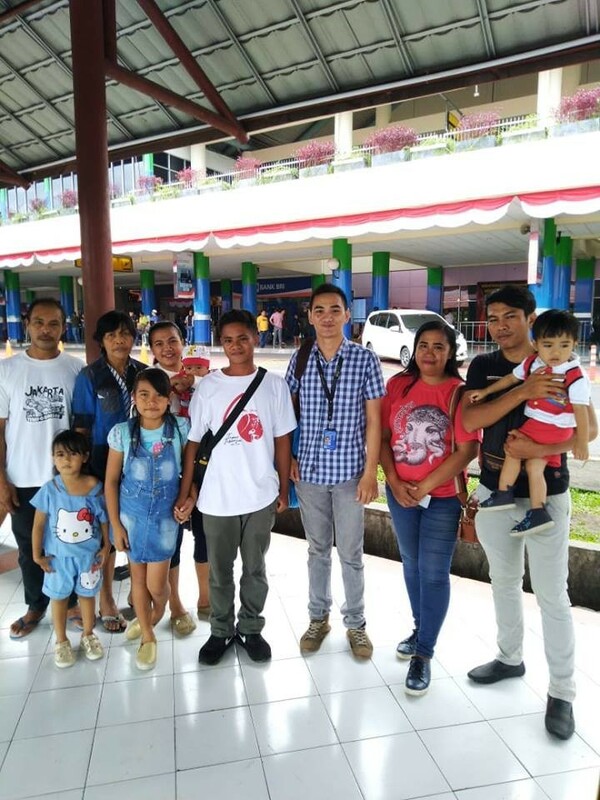 Now Aldi is back with his family in Wori, Manado, and in good health, Mirza said.